Powerstrand Rotation Resistant Ropes are comprised of 19x7 Class and the higher strength compacted 19x19 Class wire ropes. 19x7 rope (Pictured above) is a 2 layer rotation resistant wire rope with 12 outer strands. It is a general purpose rotation resistant wire rope suitable for main and auxiliary ropes on some mobile cranes, deck cranes, truck cranes and piling rigs. Use of swivels is not permitted. It is available in imperial and some metric diameters. 19x19 compacted strand rope is a 2 layer rotation resistant wire rope with 12 outer strands. Strands are drawn through dies or rollers to compact and increase the metalic density to increase overall breaking strength. It is a high strength and crush resistant rope suitable for low lifting heights. This rope is ideal for North American manufactured cranes' hoist and auxiliary ropes. Use of swivel is not permitted. It is available in imperial sizes only. 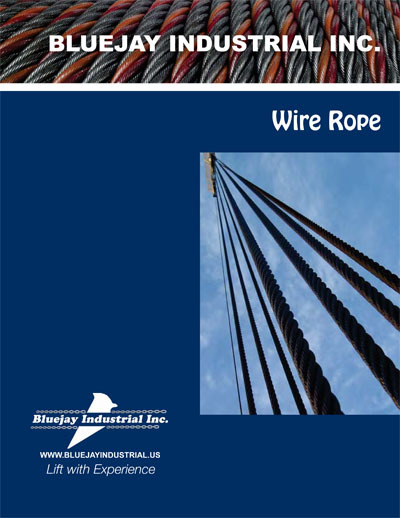 Rotation Resistant Wire Ropes by design offer resistance to rotation, but are not considered a non-rotating rope. This design has a torque imbalance causing the core to be over stressed especially where the outer strands crossover the core. Therefore, repeated cycle lifting will cause wear on the inside core. A slip and cut program must be performed to prevent unexpected wire rope failure.